Today was our last day to nail it. I believe we did. We re-made the spiral pages with premium cardboard paper with the cut out poem attached. Ironed the sheets that covered our furniture so that the medium we’re using was a professional quality. The furniture that made the cut were a door, single chair, two tables and props sources from op shops that gave a homely feel. The lights we’re using are a mix of flood lights with a red gel on them and ambient light from the room and projectors. We sported the idea of using a lamp but found that it was too much interfering with the others. We decided the projector on the floor for the start of the spiral was out of place and the position of the actual subject itself was wrong, so we went back to the original location and used a LED screen to loop the poem for he start. We also uses photo frames for the remaining cut outs of paper and formed a strange dialogue with the paper to have some kind of urgent vacation feel to the whole room. I particularly like the accidental features of our work, not least the idea of words spilling from a cup due to a break (this represents the hardship showcasing emotion through the poems and the words that are central to this idea). This was both an aesthetic pleasure and a great utilisation of the space we were allocated. The time and effort has been challenging this semester, especially with the size of our groups and the amount of creative input from every member. This has definitely been an iterative process and the theme of the whole work I believe we’ve narrowed down through the use of revisiting departure points and feedback from the year group and tutors alike. Some of the physical skills that i’ve improved in a media arts sense has been really beneficial, and the time given to us to work on this project has been a credit. 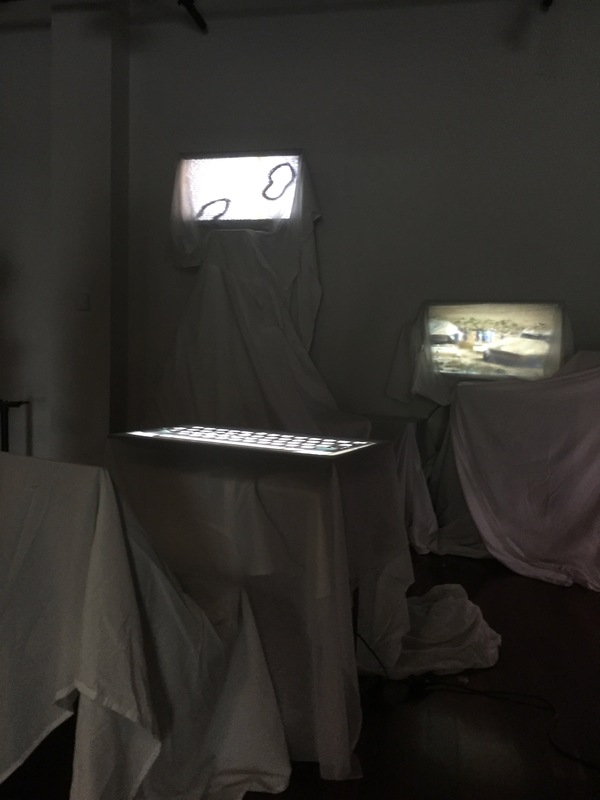 This entry was posted in MEDA301, Uncategorized and tagged media art. A second visit to the DMC by myself, Sonny and David was a prep for our last meeting together as we were all available and local. This was more so we weren’t rushed next week (monday the day before we go live). In this visit we decided to rig up the finished window, and soften the edges of the frame so that the window looked more authentic. We decided to use tape and box a square around the lens of the projector to create this. We also set up the projectors we thought we’d be using including the idea to change the table setting and the way the spiral faces so that the projection can be shined onto a piece of paper on the ground. This was done with a Quime projector under a table with a hole through some sheets, fitted to the frame of the page and run on a loop. We also decided to cut out individual words as suggested last week and integrate them apart of the central page display as the words rise less of the poem Sonny extracted is displayed until the remaining word is hell. 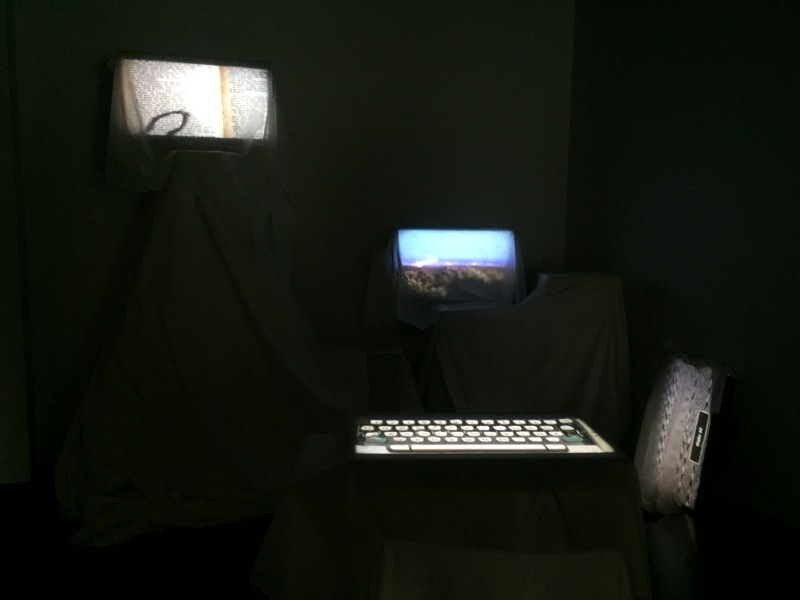 This entry was posted in MEDA301, Uncategorized and tagged media arts, Technology. What made these people leave? Fathom how extreme the world would have been, to which they were forced to flee. The intent behind their doings. Society now, after the journey. The week off for a study recess however we as a group knew we still had work to do as a collective to get this ready for presentation, so we came in anyway and continued our good run from the previous week. We spent the majority of this week making sure the furniture was exactly where we wanted it. The double sofa was alright but used a lot of space and by feedback we kinda got the vibe that it crammed everything into a corner and didn’t allow the audience to walk around the central subject. We tried a variety of abstract type set ups as well with some of the furniture, for example, Chloe tried hanging the chairs from the ceiling with rope, however, it was effective as an aesthetic but not so much creating the story or setting up a conversation between the materials. For this reason we decided to not add anything too dramatic, but to effectively place what we do have so that the space felt like it was coming forward to the audience. Sonny agreed to chat with his family to gain some content for the spiralling papers up the ceiling for weeks leading into the showcase. I believe this contextual heavy subject will only gain authenticity with these actions and provide an overarching theme to the work. Perhaps even include these findings on the paper scrolling up the work in the middle. I want to look into this being the overall theme of the works, the story starting on the ground with the original text for the responder to see, and as it goes up the paper, it slowly gets more around the room so that the story “comes to life”. We’ll see if this can be explored deeper in the next 2 weeks. Perhaps we look at the idea of it ending as it moves out into the space so that then we eventually “reconfigure storytelling” from two physical mediums, paper and space. This week we kind of began in a place that for the first time in the semester we thought we had something decent to work with. Perhaps the split of the group had something to do with this, which is what we utilised from the week before. The dual projector idea last week was scrapped. Based on feedback we needed to work on something absent or like a eerie feel of loss, so the idea of a room in the middle of an event that someone had basically had to get up and leave was the strongest. First thing was first however, we had to get rid of the typewriter on the LED screen. It was something we kind of found a way to showcase throughout all of the iterations because we thought it was a strong point or something that was positively commented on, when infact it was the only object that when we changed and ultimately got rid of this week, made us breathe a fresh air sigh. Once this was removed the idea of a lonely homely feel was instantly felt. David and Sonny continued on their video editing that was going to be showcased at some point throughout the installation on a tv screen somewhere in the room, while the remainder of us cleaned up the space and rearranged some furniture we’d been given access to try and give a sense of habitation at some given point. Chloe had a stroke of genius with a whirling type paper set up that basically started from the ground and wound into the roof and spread wide as it lifted. I found a white door that could be used to really emphasise the idea of stepping into a room and that someone has left in a hurry, and being white, gave us some inspiration as to keep the room the same. We then rigged a light with a singular beam of light using barn doors on the light, down the end of the door to give an illusion that the door is ever so slightly left open with background light seeping through. The feedback from this week was the most encouraging we’ve received and “most conceptual” we’ve presented. It’s starting to feel more like a story being unfolded into a space which is a really exciting prospect with our overall theme of reconfiguring time and space through storytelling. We tossed up some ideas of this stemming from the pages to the actual room itself. We decided that we were’t going to project onto the white out room as it was simply too hard to perfect and not effective at all if done wrong. For next week, we really wanted to knuckle down that link between the paper the space and the tv screens. This entry was posted in MEDA301, Uncategorized and tagged media art, space, storytelling, Time. This week we basically needed to showcase something and backtrack to a piece that worked in the previous weeks and not get caught up on the idea that one thing, this thing we believed could be the deletion of the sheets, as the feedback suggested it wasn’t strong enough unless it was being used as a medium. I decided to try a different approach, this time a literal approach to try and decipher the actual motivations or the story behind the work. The feedback would send us back thinking about the subjective view of the space, and that we needed to inform the responder more than just setting out the space and asking the responder to come up with their own meaning. I grabbed a pen, some paper and some objects and started jamming in a diorama setting. I had this idea that we could literally play two projectors across the space at one another: one with an exploration on the treatment of refugees and one with an exploration of what can happen when refugees assimilate. The treatment video would be attached to the ceiling, whilst the assimilation video would be playing from down below and when the audience entered the space, they would interrupt the video, blocking it. Whilst this video wouldn’t be visible, the treatment video or ‘the past’ would continue to play as we cannot change the past. The idea is that both the pastime of war and the current status of those affected can’t be re-written in history (incorporates the letters) but have to be acknowledged moving forward. The content then doesn’t have to be original it would be a remix of all the different implications of conflict on all nations and cultures. Another element suggested to us was to split into groups within our formed group and come together with works that interacted with one-another. We took our own approach on this with this new creation, and basically assigned members a good, bad and audio role, whereby no one could see the works or hear the overlaying audio and we’d basically jam it all together when everyone was done. This meant the content wouldn’t have a structure nor would the audio match the visual. We didn’t know how this would pan out but we needed to take a risk this week. My part i played around with the audio of various film trailers, songs and speeches that all had connotations towards loss, loneliness and war effects and mashed it all together. This was to accompany the montage of visuals by the other groups, however I had no idea what their creations would look like. The plan was then to stage it all in the space and see if it worked. The feedback we received was that potentially the videos could also include information about the family that lived there and that there should be longer pauses between the clips, so the televisions were flicking on and off. We agreed with this and would like to build on it next week. 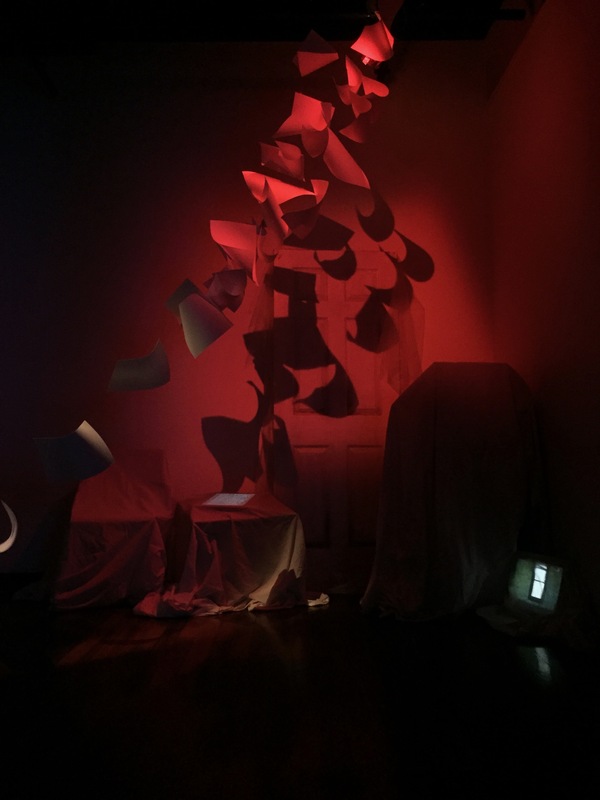 This entry was posted in MEDA301, Uncategorized and tagged MEDIAARTS, Technology. The way to approach the project was almost a daunting task, due to we felt like our iterations we getting further and further away from what actually worked really well in the early weeks of showcasing. We were advised to start disagreeing with one another and sparking debate about projects to create a sense of jamming within ourselves. Yet another iteration, this time Chloe had the idea to make a ‘room’ out of sheets utilising the square framework of the ceiling. The idea was to use these sheets as walls and a new way to project images around a contained space. We were advised by Jo to use Tulle, as when its spread over a series of layers it can project multiple copies of the one image. This was utilised to create the sense of multiple letters, using the live typewriting as this theme. The red overtone was lost due to it being too obvious in previous weeks its influence of the work. The typewriter was still one of our major success factors from previous weeks so we decided to play with positioning until we placed it on the floor below the tulle filled letters. We had a strobe light set up accompanied by a helicopter audio piece to give off the effect of outside horrors of the space. This room was suddenly turned into a house of curiosity inspired work that had themes of war and claustrophobia. An uncomfortable space to which the outside happenings forced the panic and quantity of the letters being released. The end was much similar to previous weeks. It felt like a lot of content and lacking some real direction and meaning. We also agreed that the sheets would be a very difficult medium to present on as they’d need to either be weighted at the bottom or ironed out to look more presentable. The room or disconnection to the media space and immersing the audience in a new world however, worked well. Perhaps just the content being forced onto the responder is where we need to improve on. Allowing the audience to not fully understand what the meaning behind some content features are is where we need to focus. The suggestion to fully understand an emotional connection with the happenings of such a disastrous event like war, was to gather as a group and read letters written by people involved as a group and see what sparks from this. Another suggestion was to split up as a group and formulate ideas as smaller factions, then allowing the works to speak to one another through different locations and creative process that we’ve been trying for weeks in a row. This entry was posted in MEDA301, Uncategorized. Perhaps our greatest and worst feature as a group is that we have so many good ideas that would make projects for a smaller magnitude of members. This week showcased this when we iterated feedback last week that not enough was being talked about or not enough angles and subjectivity were being explored. We decided to show an assortment of images, text, sounds and projective content that had something to do with the hardships or parodies of war. On one screen, displayed was The Tin Pot General and the Old Iron Woman, which is a satirical take on the pointlessness of the Faulkland’s war, filled with sexual innuendo and exaggerated images. On another screen, was the typed letter we’ve continued into this week, however we’ve taken the scale to one extreme to the other, making it the smallest projection shown in the whole installation and being perhaps the most excluded section of the space. 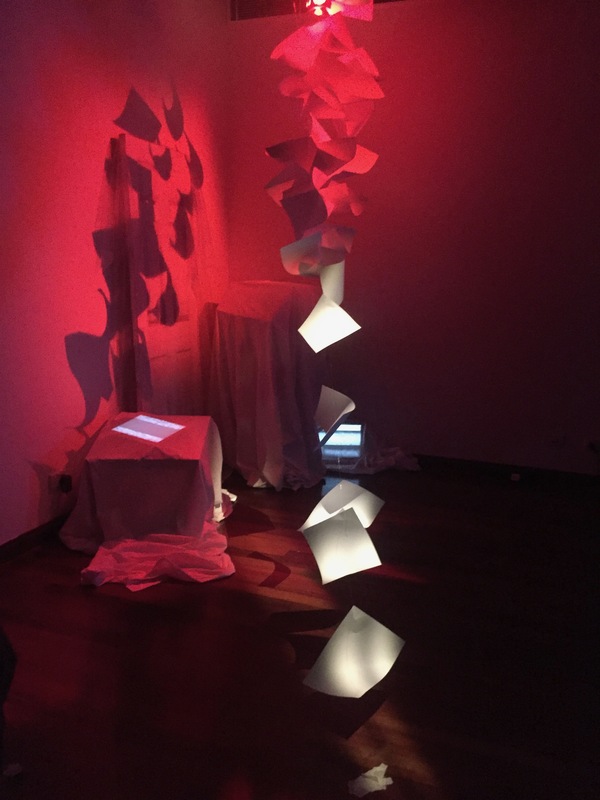 The use of the paper and projection of words onto it was re-thought as a group, we weren’t using the true materiality of the paper, and instead we could write another story onto the paper. Taking some of Mat’s feedback about using a completely different way of storytelling, like a Taylor Swift song, we decided to write the lyrics from Khe Sahn by Cold Chisel about returning home after the Vietnam War. Perhaps something we aimed for, and indeed didn’t get across effectivley was the earlier weeks of exploration of the Virtual Reality experience of being taken out of the space and submerged into another. Something was happening no matter where you look and no two people would have synced movements and audio listening. The feedback we received was that now there were too many stories and they didn’t work together well, so the space felt disjointed. Jo suggested we play with the white sheets, that maybe the empty furniture could represent the home of a family who had fled and this is what they left behind. Perhaps the idea of the previous work I created with white spaces creating a sense of ambient presence.